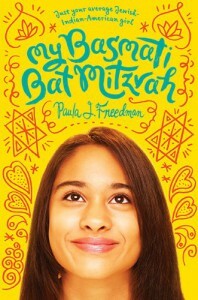 My Basmati Bat Mitzvah is a cute novel about navigating your way through the different cultures that make you up. There’s good commentary here on social, racial and religious issues, something I wish I saw more of in MG and YA fiction. 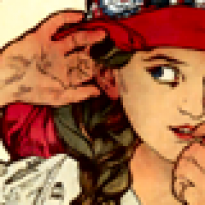 The real standout aspect of the novel is Tara’s voice. It would have been far too easy to slip into a caricature of a twelve year old girl’s voice, but Freedman keeps it feeling realistic and natural. Tara herself is a fun character, a pretty typical twelve year old girl who has her moments where she’s highly unlikeable, and makes mistakes like anyone else. I really enjoyed reading about her and her struggle to express both of her heritages and cultures in her bat mitzvah. Her family was well fleshed out, specifically her mother and grandmother. I wish her friends had the same treatment; there’s one girl Tara initially dislikes, Sheila, who does get a great deal of depth, and Ben-O, Tara’s best friend/love interest. But her initial best friend, Rebecca, is sort of thrown to the wayside after a while in favor of Sheila. Another downside, since this is a character driven novel, is that at times it did feel a little aimless. It would quickly reorient itself back, but there were times when I found myself wondering, “Okay, where is this going/what was the purpose of that particular scene?”	Still, I really enjoyed reading My Basmati Bat Mitzvah, and I’ll definitely look into recommending it to people looking for a MG novel that focuses on the things it focused on.See more of my reviews at On The Nightstand. A copy of this novel was provided by the publisher through NetGalley.